More than 40 women — some famous, many unknown, of all ages and professions and socio-economic levels — have participated in a music video that uses a recording of the 1971 Spanish feminist anthem Yo no soy esa (“That’s not me”) to promote women’s rights and equality and to commemorate International Women’s Day 2016 today in Spain. 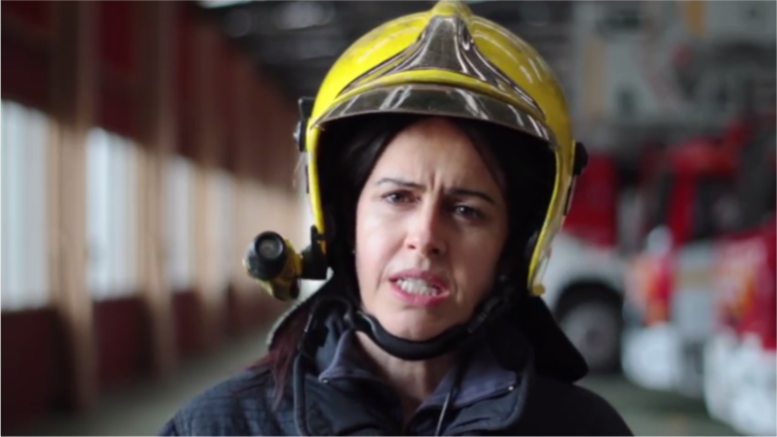 The track Yo no soy esa by Maria Trini plays throughout the brief video, with the lyrics lip-synced by a cast of Galician women who include a market vendor, a firefighter, members of the Symphonic Orchestra of Galicia, the actress Isabel Blanco, the CD Zalaeta women’s rugby team, young girls aged two and six, the singer Rosa Cedrón, the Galician bagpipe musician Susana Seivane, a cleaning lady, an 80-year-old grandmother, the poet Yolanda Castaño, a hairdresser, the singer Lis Teuntor, a synchronized swimming team and many other women. Mari Trini (or Maritrini), was a Spanish singer who died in 2009 at the age of 62 and was very popular throughout Spain in the 1970s and ’80s, selling more than 10 million records during her career. Her 1971 hit Yo no soy esa was a remake of an old Spanish copla song Yo soy esa, but with a feminist twist: that women should be free to be who and what they want and to act outside the accepted norms and roles for women in society.